I would like to state for the record that I am in a perma-food-coma. It started around Thanksgiving, and started to wear off, but then came back in earnest around December 18th and has been going strong ever since. I'm hoping that it wears off this weekend. The holidays are not for diets. Not that I diet anyway, but if I did, the holidays would NOT be the time. And by Holidays, I mean Thanksgiving through New years (heck lets say through the Super Bowl, just to be safe). I LOVE all the delicious foods that we eat over the holidays. As I'm sure you can guess, desserts are some of my favorites. One of our traditions is that we do a huge Christmas Eve dinner with Chris's side of the family and I provide the dessert. I used to make pumpkin and apple pies, but then I decided that we needed a new tradition. 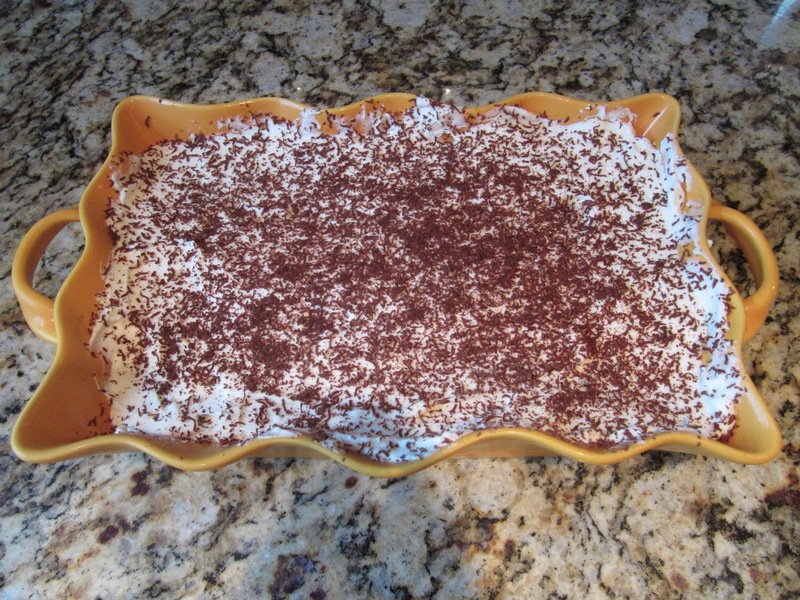 So, a few years ago I decided to try my hand at making homemade Tiramisu. I googled around for a good recipe, and since I am a sucker for making everything from scratch, I gravitated to a recipe that included home made lady fingers. 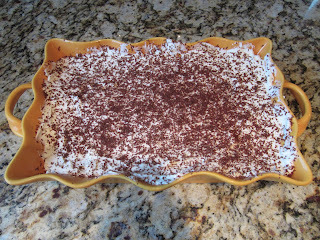 I used Emily's Famous Tiramisu as my template, and of course, tweaked it (More Coffee & More Rum!). If you want to see the original recipe, you can check it out on AllRecipes.com (that is where I find all my good recipes). Anyway, this is a fantastic dessert, you have to make it. Plus, it looks really fancy, so people will be really impressed when you serve it to them. This year, I was just getting the tiramisu started, when Hunter decided that all he wanted to do was be held by me. He's in a "I only like mom" phase right now. I'm pretty good at doing things with one hand holding the baby, and using the other to multi-task, but unfortunately, tiramisu is a 2 handed job. So Chris stepped in and took over dessert, even though he is averse to baking. 2. Whip egg yolks and 1/4 cup of sugar with an electric mixer until thick and pale. In a separate bowl, whip egg whites to soft peaks, then gradually sprinkle in the remaining 1/2 cup sugar while whipping to medium stiff peaks (don't add the sugar until you get peaks). Fold the egg yolk mixture into the egg whites. Gently fold in the flour and 1 teaspoon vanilla. The batter should be thick and pale yellow. 3. Put the batter into a gallon size ziplock and then snip the corner. Draw parallel lines onto another piece of parchment that are 2 inches apart. Pipe the batter back and forth just between the lines in a compressed S motion, until you run out of batter. 4. Bake in preheated oven 10 to 15 minutes, until firm but not browned. Remove from the oven and dust generously with powdered sugar. Set aside to cool. 5. Stir together sugar, boiling water, coffee & rum until sugar is dissolved. Set aside. 6. To make the filling, combine mascarpone, powdered' sugar, rum and vanilla in a large bowl. Whisk together until completely smooth, scraping the bottom of the bowl to remove any lumps. Gradually whisk in the heavy cream. Whip with an electric mixer until soft peaks form. Stop whipping when the mixture shows the first sign of graininess. 7. To assemble, line the bottom of a casserole pan with parchment or waxed paper. 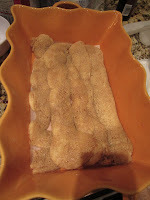 Place ladyfingers in the bottom of the pan, making sure to cover the bottom. Brush generously, but do not soak completely, with syrup. 8. Spread half of the filling mixture over the first ladyfinger layer in the pan. Place the remaining ladyfingers on top of the filling. 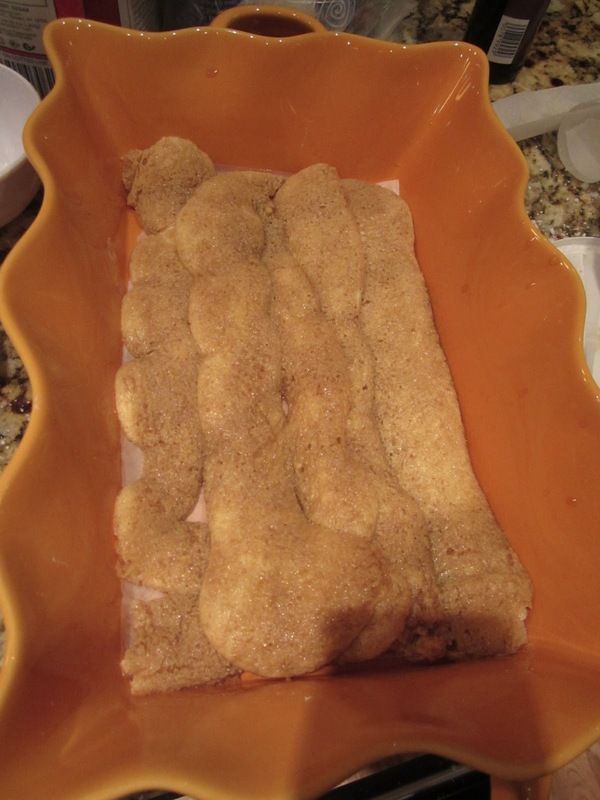 Soak the second ladyfinger layer with syrup until it cannot take any more (you will have extra syrup). Spread the remaining filling over that and smooth the top. Sprinkle with grated chocolate. Refrigerate at least 4 hours (overnight or longer is best). We ate the tiramisu for at least the next 3 days, and it kept getting better and better. We all enjoyed it, even Ketchum, who managed to snag an unattended piece while we were opening presents. He's a naughty puppy. Hope you enjoyed all your holiday desserts as much as we loved ours.